buying some at the moment that he met Gregorio Fuentes, who was to become his inspiration for the novel The Old Man and the Sea. Bermuda onions were at one time quite the thing. They are described as flat topped, sweet onions with white or yellow skin and come in three varieties- Yellow Bermuda, White Bermuda and Crystal Wax. The seeds were brought to Bermuda some time before 1888 and onion growing soon became a business. At the time, shipbuilding, which used wood from the many cedar forests on the island, had been the primary industry. This all went away with the event of steel ships. 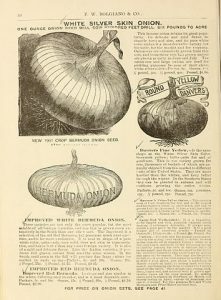 By the 1890’s the US was importing the onions from Bermuda and it became a significant source of income for the island. Bermudians, in fact, were known to refer to themselves as ‘onions’. Then, around 1920, Texas, who had also imported the same Canary Island Seed, became the major supplier, much to the detriment of Bermuda. Later on, Texas replaced this variety with a new onion from Spanish seeds and by 1926, the ‘Bermuda Onion’ was mostly just a memory. Citation: Oulton, Randal “Bermuda Onions”. Cooksinfo.com Pub. 19 May 2004; rev. 9 Sep 2005. So what foods are typical of Bermuda then? There is some dispute over what might actually be considered the national dish. 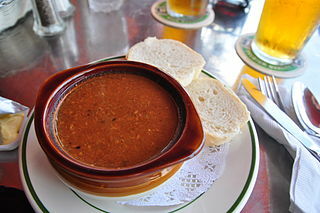 Many will say that it is Bermudian Fish Chowder. Originally a poor man’s food, this delicious spicy chowder contains, everything from rum to the famous Bermudian condiment Sherry Peppers Sauce. Also served on the side in small carafes, this potent sauce is made by steeping pequin peppers and 17 herbs and spices in dry sherry for a period of several months. It was first made in the shipholds of the British Royal Navy. The peppers were grown on the island and the navy would add them to their sauce to spice it up when they stopped over in Bermuda. The authentic stuff, Outerbridge Original Sherry Peppers can be purchased on Amazon for under $20. Another contender for national dish seems to be cassava pie, which is a sweet, spicy cake with a meat filling. An unusual combination of sweet and savory, this pie uses the cassava root, which is actually poisonous, containing cyanide until it is properly treated. It is also known as yucca and tapioca is a product extracted from the root. Local seafood such as the distinctive and expensive Wahoo figure into the cuisine of Bermuda as well. Fish cakes, cod and potatoes and, of course, fish chowder are all common and well loved dishes. Most anything can be grown on the island. Some more unusual items include pawpaw, a fruit that actually grows in many of the eastern states, but is largely neglected. It is related to the soursop, cherimoya and custard apple. Not that those are all too familiar either! Pawpaw casserole is a popular dish made with pawpaws, tomatos, onions and cheese. The loquat is a yellow/orange plum like fruit that figures into many Bermudian dessert dishes as well as local spirits. 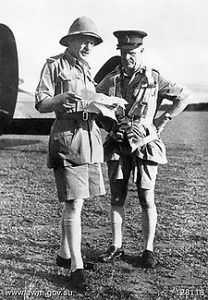 British military commanders Brooke-Popham and Wavell in WWII. Bermuda is well known partly due to Bermuda shorts, which are considered appropriate business attire on the island when made from suit like material and worn with knee length socks, a button down shirt, tie and blazer. They are usually tailored and are cut above the knee, unlike capri or cargo pants. 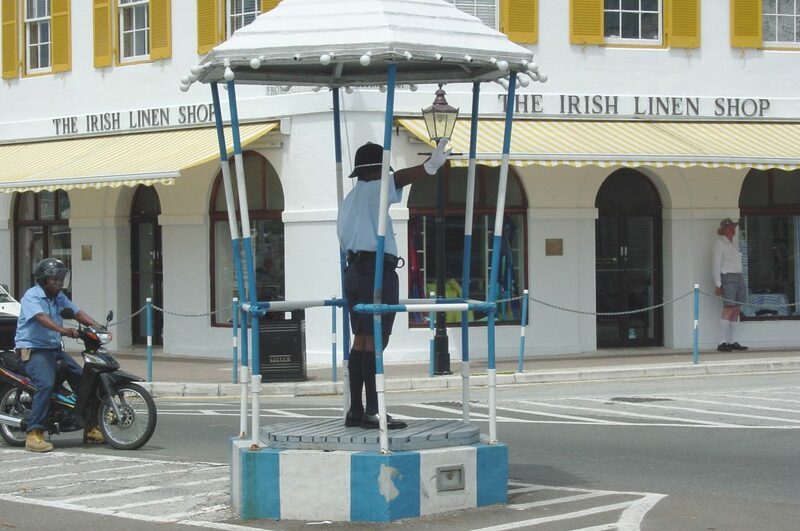 They became common in Bermuda during World War II, when a shortage of clothing in Bermuda led the managers of two banks to have tailors make two pairs of shorts, based on the shorts that the British Army wore in hot climates, for each male employee. They also provided two pairs of heavy long wool socks along with the shorts. They are still popular in Bermuda and are likewise still worn by the British Royal Navy. And, of course, people around the world wear them all the time, though not so often as business attire.! 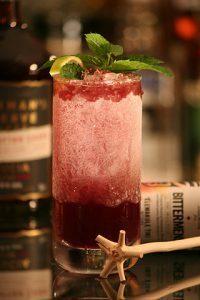 The most popular drinks in Bermuda are the Bermuda Swizzle and the Dark and Stormy. Bermuda produces Gosling’s Rum, which is a key ingredient in both. 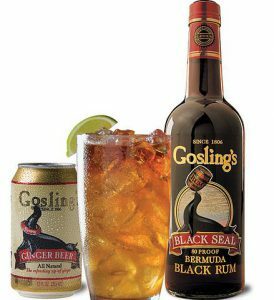 The Dark and Stormy is just a couple ounces of rum, preferably Gosling’s Black Seal, and ginger beer and ice. Gosling’s also makes a ginger beer just for that very purpose. than shaking or stirring your drink, you ‘swizzle’ it by rubbing a swizzle stick between your palms while simultaneously lifting it up and down. The real swizzle stick, historically speaking, is a long stem snapped from a lélé tree. It is a small stick with a knot of 5 branches at the end. The tree grows in the wild near certain rivers in the Carribbean and they are quite hard to find. No lélé gatherer will tell you where he got his! Unless you are lucky enough to have a real boi lélé, as the authentic ones are called, you can probably find a plastic version at Target or somewhere. This month’s cocktail is a swizzle I created. I decided that since Bermuda shares the same latitude (32°) as the Madeira Islands, I would play around with that idea and mix some Gosling’s, Madeira and a couple of other things and see how it goes. And, no, I do not have an authentic boi lélé! Shake all ingredients with a few pieces of ice in a shaker (unless you have a nice boi lélé or swizzle stick!) Pour into a pilsner or tall glass filled with crushed ice. 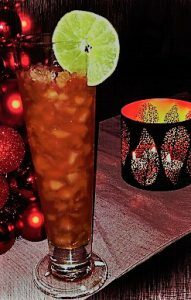 Garnish with a dash or two of Angostura on the top and a slice of lime. 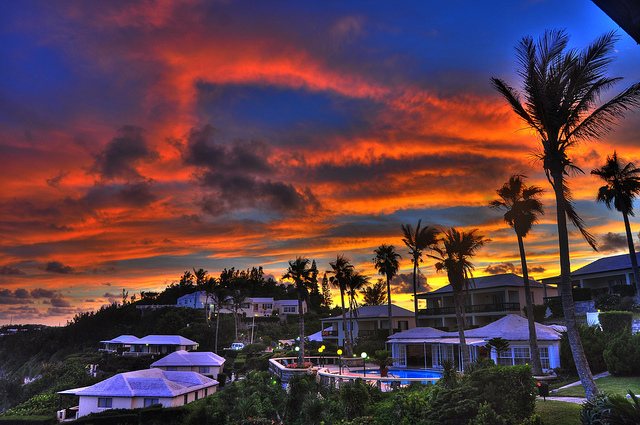 And here’s one last photo of a beautiful sunset in Bermuda. Don’t you wish you were having cocktails there?